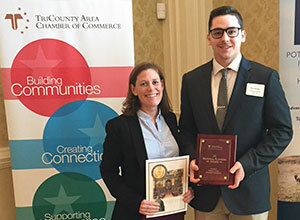 The Chester County Planning Commission recently was the recipient of the TriCounty Area Chamber of Commerce’s 2018 Regional Planning Award for assisting with the Route 724 Initiative and completing the Opportunity Sites Map. The mission of the Route 724 Business/Community Corridor Initiative, which is being led by the Chester County Economic Development Council (CCEDC), is to advance economic opportunities in the Route 724 region with initiatives identified by stakeholders. The Route 724 Opportunity Sites Map addresses stakeholder interest in having a tool for the CCEDC to use to market the Route 724 corridor. The Planning Commission assisted with the marketing initiative by making an interactive map that highlights development opportunities along the 12-mile Route 724 corridor in northeastern Chester County. Each opportunity site was based upon municipal input and alignment with Landscapes2’s framework for growth. View the Route 724 Opportunity Sites Map. Planning Commission Community Planner Jaime Jilozian was the lead planner for the map project. The map was created by Planning Commission Technical Services Specialist Doug Meneely with oversight from Technical Services Director Paul Fritz, Technical Services Supervisor Gene Huller, and Executive Director Brian O’Leary. The Planning Commission worked with James Logan, a former CCEDC employee, and CCEDC Senior Vice President of Business Development Services MaryFrances McGarrity. CCEDC coordinated all municipal input and participation for mapping specific sites. “This project has been a great collaboration with CCEDC and it has been a meaningful step for the initiative in taking on real implementation through this project,” Jilozian said. Eileen Dautrich, president of the TriCounty Area Chamber of Commerce, said her organization presents awards to projects impacting economic development at the Economic Development Luncheon every fall. This year the event took place on November 13 at the RiverCrest Golf Club and Preserve in Phoenixville. She said the Regional Planning Award is presented to an organization that develops and implements a multi-organizational plan that fosters smart growth. “This year it is our pleasure to recognize two organizations that work cooperatively every day to the benefit of Chester County and recognize them for the Route 724 Business/Community Corridor Initiative and their work on the Route 724 Opportunities Map,” Dautrich said. “The Route 724 Opportunity Sites Map is a project that implements a priority objective of the committee to market the Route 724 Corridor within the framework of Chester County’s Landscapes2” (the county’s current comprehensive policy plan). Previous Regional Planning Award recipients have included multiple townships, legislators, and organizations working cooperatively to improve and make a significant impact on the tri-county region where it pertains to economic development, transportation, or quality of life, according to Dautrich. The Planning Commission has worked on a similar project for the 50-mile Route 1 corridor in southern Chester County. Planning Commission GIS Planner Colin Murtoff worked on this project with McGarrity at CCEDC. View the Route 1 Opportunity Sites Map.